If you haven't already heard of Miracle Noodles, you're missing out. Low carbs, low calories and gluten-free? Count me in! Thanks to Cassey Ho of Blogilates.com, this pasta-loving girl finally found a way to enjoy her favourite food in a healthy way. And after putting this product on my Christmas list last year, I feel like I've completely improved my diet thus far. 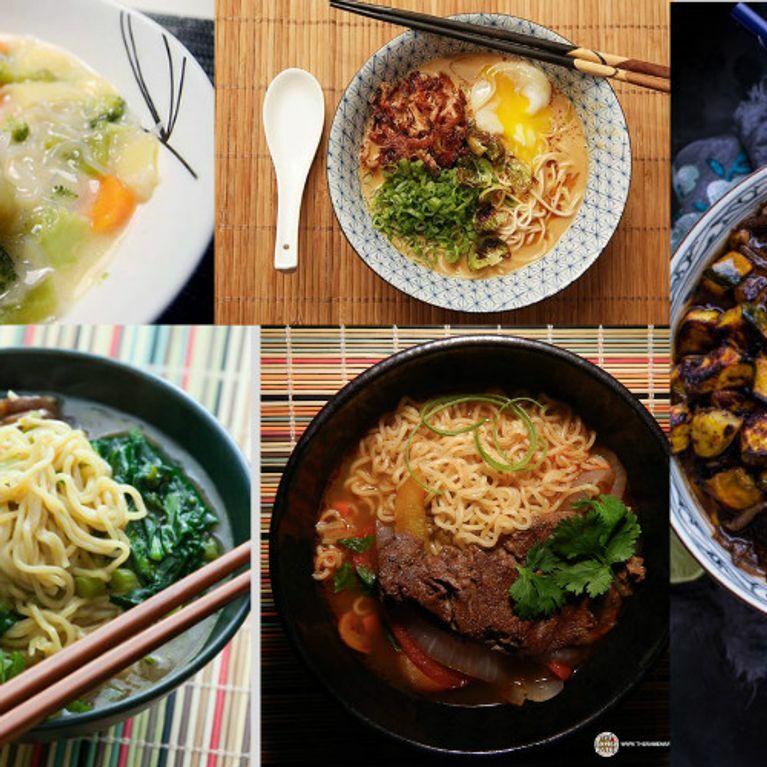 If you're anything like me and love noodles, you'll also enjoy these healthy and delicious recipes all made using Miracle Noodles. Seriously though, thank God for the person who decided to come up with these noodles, which contain zero net carbs. Also, thank you to the Abe's Market team for this beautiful, Asian-inspired dish. I could cry over how beautiful this is and I already know what I'm cooking up for dinner. Find the recipe here. Vanessa Romero's stiry-fry is so easy... it's a miracle. Hah, see what I did there? This meal only includes a few ingredients (peppers, celery, onion, garlic, mushroom and chicken) and is super easy to whip up after a long day of work. Meals made easy - that's the way to go. Check out this delicious recipe. With her amazing POP Pilates videos aside, Cassey Ho knows how to make some awesome dishes with her Miracle Noodles. There's pretty much no way I could ever live without pho in my life because it's just so dang good. Find this yummy pho recipe on Blogilates. Cold outside? No worries. If you try out some of this shirataki noodle and bean sprout soup, you should definitely warm up in no time. Plus, this recipe only takes 10 minutes to prepare and 15 minutes to cook. There's nothing better than a fast and healthy meal! SparkPeople's Miracle Noodle soup can be found here. Seafood and zero calorie noodles are a thing of beauty. I think my heart's crying. Shrimp is already tasty and healthy for you, so this dish is top notch. See the recipe. I haven't found it socially acceptable to use this in a while but... YAAAAS! There's nothing I love more than spaghetti and meatballs, so this spaghetti-inspired angel hair and meat sauce dish is pure perfection. I'd probably eat meatballs instead but at least I can eat a whole plate of Miracle Noodles without feeling too guilty about it later. Here's the dish! If you like your food spicy then you'll definitely enjoy Gretchen of Balanced Grettie's noodle dish, which uses Sriracha sauce, onions, mushrooms, basil leaves and soy sauce. Find the recipe here. I know what you're thinking... Miracle Noodles in your cookies?! You probably didn't see that coming. However, this amazingly simple dessert really does use Miracle Noodles, two eggs, cocoa powder, baking powder, salt and honey (or Stevia as a substitute) to make a 10-calorie chocolate cookie. Satisfy that sweet tooth with this dessert. Under 300 calories, this shrimp curry shirataki noodle dish is heaven. What more do you need? Discover the recipe here. There's no doubt about it: You'll be extremely pleased to try out this fantastic sukiyaki dish. Full of carrots, zucchini and edamame, this meal will be a crowd-pleaser when you have gatherings at your house. Check out Merci Mama's recipe for all the details! Have you tried Miracle Noodles yet? Tweet us @sofeminineUK!